As mentioned in my previous post, the upcoming posts would be the recipes of what I had tried for Krishna Jeyanthi. Most of them were first-time trials and I believe I did a good job. This appam is a traditional dish which is usually made from raw rice by grandmother during Karthigai Deepam/Janmasthami etc. I did try that version too this time. But still due to lack of confidence I had this as a backup. Hubby and my little munchkin loved it and in no time it was all over.I didn’t have enough to even click some ok ok pictures(I know I click only very sumaaar! 🙁 😉 ). Next time I should save some to click better. They just melted in the mouth and the flavour just pulled us to have more and more.You can make it instant or you can rest the batter and do it after a few hours s.
A very simple puree combination for your little one which is extremely creamy and delicious. This can be offered from 6 months. After 7 months prefer to give this mashed instead of puree. 1.Wash apple and pear well. 2.Peel and de seed and chop into pieces. 3.Remove the skin of banana and slice. 4.Add them to the blender and grind with water/milk. The colour depends on the variety of apple and banana you use. I chose the golden pear which is yellow in colour and Indian apple which is soft. You can also remove the black part of banana and blend. Do not let this puree stay for a long time. I don’t prefer cooking fruits as I feel there might be a nutrient loss. You can however steam cook pear and apple gently if you wish. You can offer this after 6 months after ensuring that your baby is not allergic to any of the above mentioned ingredients. Always sterlise the bowls you use for baby. Have a word with doctor before introducing any new food to baby. Pear is a fruit which has plenty of vitamins,anti oxidants ,dietary fiber and minerals. They come in many varieties and the classification is based on the land of cultivation. They come in various colours and textures. For babies it is okay to peel the skin but for adults and and kids it is recommended to be consumed with the skin. The dietary fibre present helps in curing constipation and it is low calorie fruit. It is a very light,easy to digest and least allergic fruit which is loaded with Vitamin C ,minerals like iron,copper,manganese,magnesium,ribofavin. This fruit in gut-friendly and also prevents from cancer. Choose a firm and ripe pear. Pears ripe from inside to outside. hence when you thump the fruit,it should hardly yield to the thump. Do not buy a pear which is very soft and easily easily to your thump. It means the fruit in rotten. Refrigeration is not required for pears. If you wish to refrigerate ,do it after it get ripened. The fruit is ready to eat when it yields to a gentle thump. Smoothie vs Milkshake – This has always been a debating topic in my brain. I finally found a simple line to explain its difference. Smoothies have the fruit as the basic ingredient whereas milkshakes have milk or ice cream as the basic ingredient. I prefer smoothies and milkshakes only when I visit restaurants. Because I believe in actually consuming a fruit as such is always better than smoothie/juice/shakes. When it comes to preparation of shakes I rarely do it for my husband for an evening snack when his schedule is undetermined. I just made a random attempt of making a smoothie for my son and he loved it. I just picked the ingredients at random and blended. From now on I will keep trying more smoothies.I just love that taste. It is a good option for kids who don’t eat fruits as such. 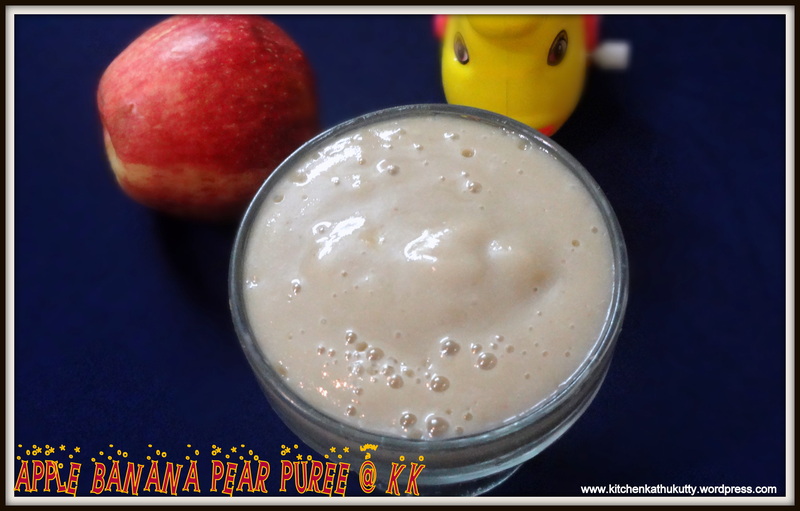 Healthy drink for mothers who keep missing meals at the right times. 1.Soak almonds in luke warm milk. 3.Use a spoon to scoop the flesh. 5.The almonds would have turned soft. You can peel the skin or add such. 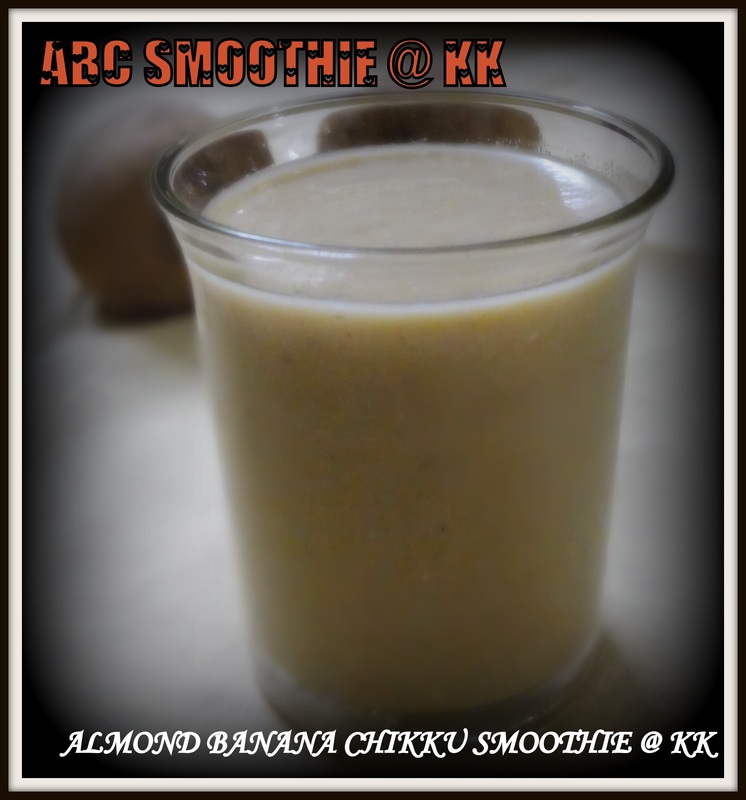 6.Blend almond,banana,chikku into a fine paste. 7.Add palm sugar and milk and give a quick run. 8.Transfer to a serving glass. You can skip milk and add water for babies less than 1 year. If you prepare for the entire family you can add ice cubes and serve. 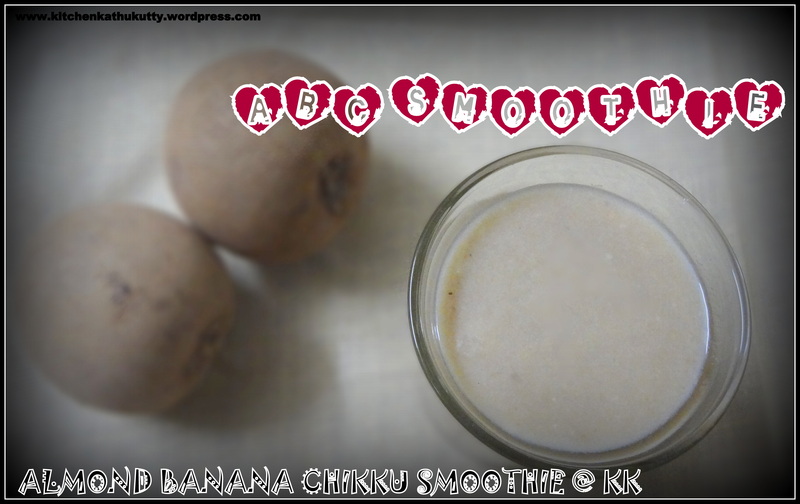 You can also use frozen banana and sapota to have a chilled version. 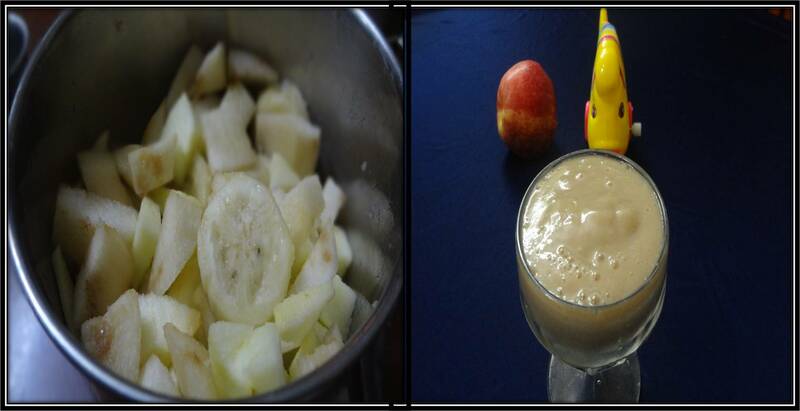 For babies less than one year remove the black seedy part of banana before blending.